Recently we published part one of our series on cardiac troponins. If you haven’t checked it out yet, you can find it here. In the second part, we’re going to take a look at high sensitivity troponins and some of the more advanced areas around understanding cardiac troponin and its use in practice. We’ll give you a quick run down on the troponin lingo – the language you need to be able to speak in order to fully understand how to use high sensitivity troponin in your practice, including terms like the limit of blank, limit of detection, co-efficient of variation and 99th percentile. What if we called it "low specificity troponin" instead of "high sensitivity troponin?" Would that knock some sense into people? Listen to the podcast to find out more about not just troponin, but ‘high sensitivity’ troponin…..
High sensitivity cardiac troponin (Hs-cTn) assays were first introduced in 2009. In many parts of the world (including the UK) we’ve been using high sensitivity troponin for quite a few years now. At my own hospital we introduced high sensitivity troponin in 2011. If you know much about troponin, however, you’ll be aware that these assays have been pretty controversial. In the US, the FDA is still to approve high sensitivity troponin assays, for example – so they can’t be used in practice there. As we explain in the podcast, when we talk about ‘high sensitivity troponin’ we’re talking about troponin assays with high analytical sensitivity. There’s a big difference between analytical sensitivity and diagnostic sensitivity. In fact, for an assay to be labelled as ‘high sensitivity’ it doesn’t necessarily need to be able to pick up more acute myocardial infarctions. 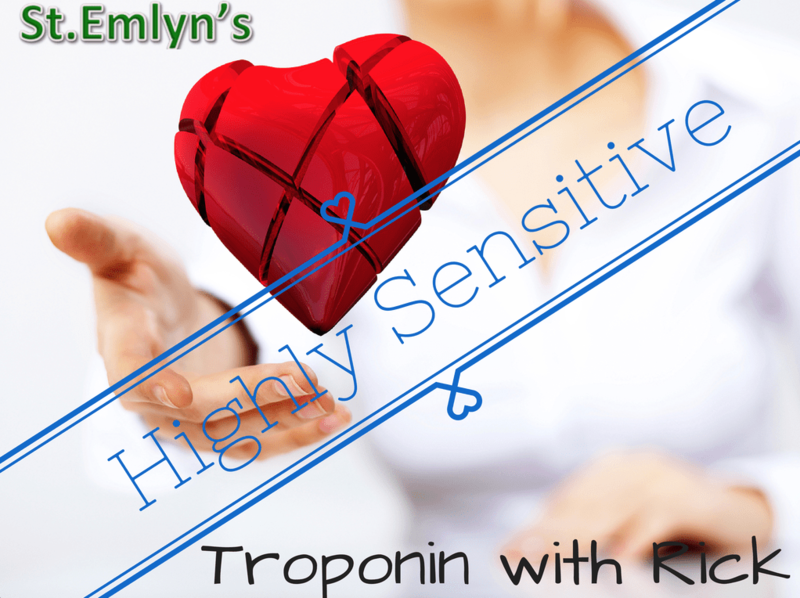 There are just two essential criteria for a troponin assay to be called ‘high sensitivity’. The assay should have a high enough analytical sensitivity (i.e. be able to ‘see’ low enough troponin levels) to enable levels of troponin to be detected in at least 50% of “normal” individuals, i.e. apparently healthy people who don’t have myocardial disease. With previous troponin assays, it wasn’t possible to measure such small levels of troponin. This meant that having any detectable troponin in the blood was abnormal, but now that technology has moved on we know that everyone will have very small amounts in their blood. With a high sensitivity assay we’ll be able to detect that in at least half of all healthy people. This varies depending on the test that you’re using. In order to understand this a bit better, we need to know the definitions of a few important terms. The limit of detection (LoD). This is the smallest troponin concentration that you can reliably distinguish from the LoB. Here’s some more reading if you’re interested. The Abbott Troponin I test which has a cut off of 26ng/L and a LoD of 1.9ng/L. The LoB is 1.3ng/L. The Roche Troponin T test has a cut off of 14ng/L, a LoD of 5ng/L and a LoB of 2ng/L. The Beckman Coulter AccuTnI+3 troponin I test, which has a 99th percentile cut-off of 20ng/L, a LoD of 10ng/L and a LoB of 3ng/L. Whatever troponin assay your lab uses, you can find the key details in this troponin table published by the International Federation of Clinical Chemistry. Check it out. Is your lab really using the appropriate 99th percentile cut-off to diagnose AMI? If not, why not?! 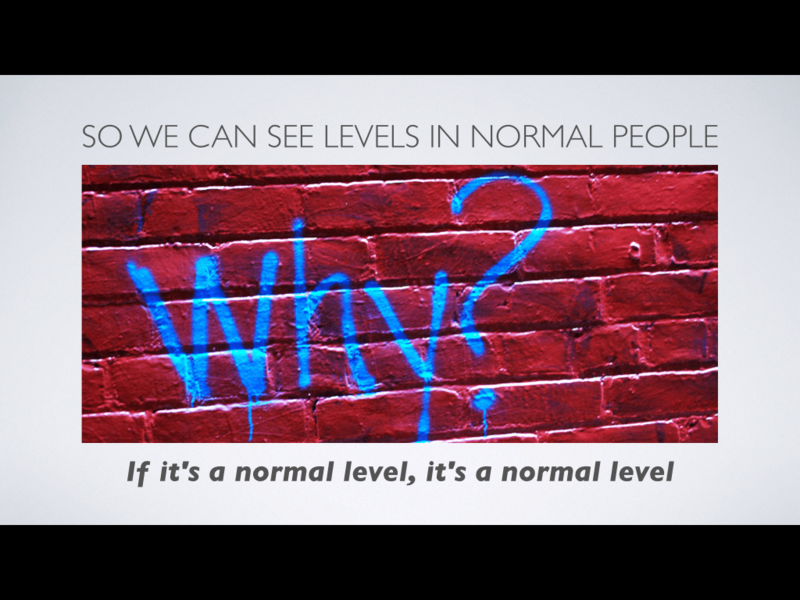 From the great troponin debate between myself and Louise Cullen at SMACC Gold: Why on earth do we need to detect troponin levels in normal, healthy individuals? Well here’s a good question. If the patient in front of you is normal and healthy, why would you want to know how much troponin is in their blood? Actually, this is a very fair point because whatever the actual level is, if it’s below the 99th percentile it’s still a normal level and you wouldn’t ordinarily change a patient’s treatment in any way, regardless of whether the troponin level is right at the upper end of normal or completely undetectable. There is however, a potentially good way that this can help us in the ED. As with all diagnostic tests (and as Simon and Iain previously discussed in our podcast), if you lower the cut-off then you get a higher sensitivity and a lower specificity. If we’re after a good ‘rule out’ test then it’s a high (diagnostic) sensitivity that we need – because we really don’t want to miss an important diagnosis like AMI. With that in mind, we published a paper in 2011 that asked whether it would be possible to safely ‘rule out’ AMI in patients who have completely undetectable (I.e. not just normal – really, really low) levels of troponin on arrival in the ED. (You can get the full text as #FOAMed). We found that this strategy had 100% sensitivity and negative predictive value for AMI. If we can validate those findings, potentially this could help to reduce unnecessary admissions. Of course, although the specificity of that strategy seems low, we wouldn’t label patients with AMI just because they had detectable troponin levels – those patients would still have serial samples to decide. And the specificity of that strategy for deciding whether a patient needs hospital admission is higher than normal practice, after all, because it reduces the number of patients needing admission. High sensitivity troponin assays do have a higher diagnostic sensitivity for AMI. They pick up more AMIs using the first sample at the time of arrival in the ED, and they also pick up more AMIs using the later samples. This means that some patients would previously have been ‘troponin negative’ and diagnosed with unstable angina – whereas now they’d be diagnosed with NSTEMI. You can find more details in this publication by Evangelos Giannitsis. Hand in hand with having a higher diagnostic sensitivity, high sensitivity troponins have a lower specificity, which means more false positives. And, as we discuss in the podcast, we have to think carefully about how to deal with these. 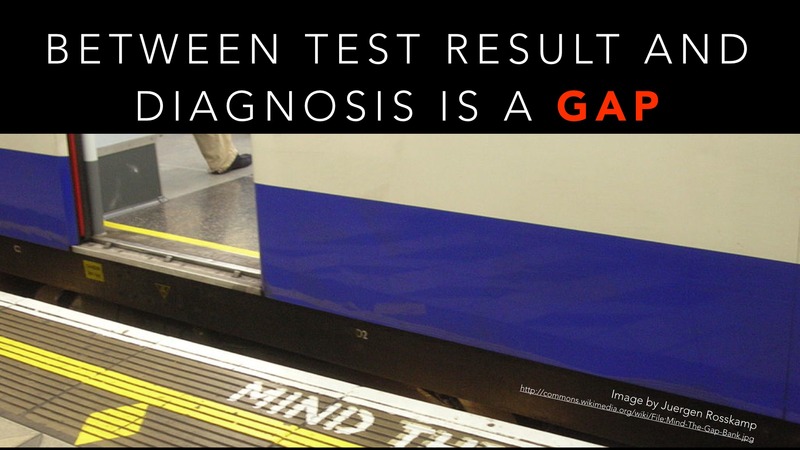 Most importantly, it’s really important to recognise that a false positive test result isn’t the same thing as a false positive diagnosis. A clinician makes a diagnosis. A troponin test, no matter high sensitivity, doesn’t. Never has. Never will. You can get more tips from our previous blog post on why hypertroponinaemia does not always equal acute myocardial infarction. And you can get plenty more by tuning into the great discussion I had with Iain during our latest podcast. We’ll explain what a high sensitivity troponin really is and talk about how we might use it in practice to improve patient care. So, in summary, high sensitivity troponin has a lot of great characteristics that could really help us in the ED – but they do bring us some challenges and as such they’re still controversial. For the full story on that you should keep an eye out for more from us about the debate that I had at SMACC Gold with Louise Cullen about whether High Sensitivity Troponin is a Friend or a Foe in the Emergency Department! Hope you enjoy! Please keep the feedback, questions and comments coming. As always, we’d love to hear from you. DOI: Much of my research work involves Hs-Tn. To help with this I have received reagents from companies who make Hs-Tn assays and I’ve accepted the provision of travel and accommodation to present findings at industry sponsored conferences, but I haven’t received any other financial benefit or gifts in kind as part of my work and have no financial ties to any companies. Thanks for this blogpost. Are you using HScTnT in Manchester? If so, how are you getting on with them? Is there a significant additional in-patient burden with the 4 hour target? For patients awaiting the result of the three hour troponin? Yes, we use hs-cTnT in Manchester. At the moment we haven’t moved to the 3-hour rule out strategy – largely because there are issues to do with some of the caveats I mentioned in the other blog post on the new NICE recommendatoins – http://www.stemlynsblog.org/nice-high-sensitivity-troponin/. We’ll move to a 3-hour strategy for low risk patients soon, I’m sure – but we might do a bit of preparatory work to look at the likely impact locally first. If we were to use a 3-hour troponin, patients would still need to be admitted to hospital. It would be impossible to get the results, have them interpreted, see the patient and make an appropriate decision within the 4 hours permitted in the UK. 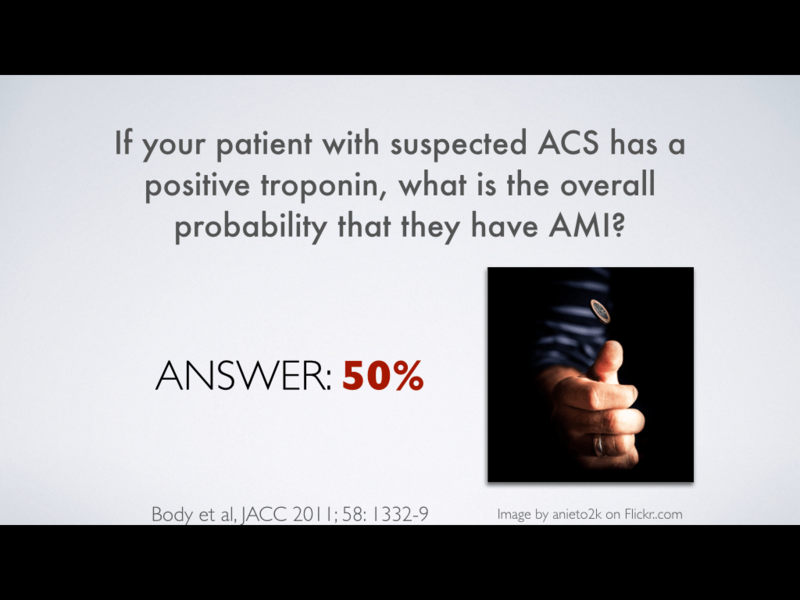 A strategy that might work better in the ED is exclusion of AMI in patients who have extremely low levels of troponin using the high sensitivity assay (e.g. <3ng/L). You can find our first paper on that here (it's FOAMed) – http://www.sciencedirect.com/science/article/pii/S0735109711024247 – and there'll hopefully be more out on this pretty soon. In discussing this with our cardiologists, they’re keen to get ACS Rx on board early (i.e. after the first HScTnT) if it’s above 14ng/L. Are you giving the ACS Rx in Manchester after the first troponin or are you waiting for the delta troponin before giving the ACS? Strictly speaking, my understanding was that the rise/fall was needed before the MI dx could be made. Also, given the PPV of only 50% you mentioned in the podcast, it would seem a lot of patients may receive ACS Rx who may not be having an ACS, and incurring the risks of over-treating our patients.